The new home of the Minnesota Vikings will host ESPN's X Games in July of 2017 and 2018. 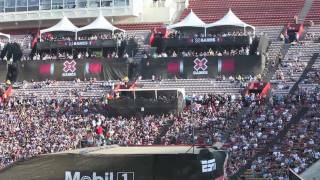 City leaders made the announcement on the western plaza of the stadium as four Moto X riders sped up ramps to turn flips in the air and land on a second ramp. Before it even opens, U.S. Bank Stadium added another major sporting competition to its roster of upcoming events. The new home of the Minnesota Vikings will host ESPNâ€™s X Games in July of 2017 and 2018. City leaders made the announcement on the western plaza of the stadium as four Moto X riders sped up ramps to turn flips in the air and land on a second ramp. The X Games target and appeal to millennials. The four days of events feature skateboarding, BMX and the Moto X competitions as well as music and cultural activities. 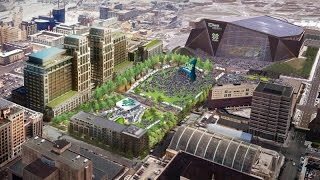 Minneapolis City Council Member Jacob Frey said the city can use the games to showcase how hip, healthy and beautiful the region is. Council President Barb Johnson said once the games are held here, theyâ€™ll never find a better venue. The stadium already has won bids to host the 2018 Super Bowl and the 2019 Final Four. For the past two years, the X Games were held in Austin, Texas, in June with about 45,000 people attending each year. The Minneapolis convention bureau has estimated the economic impact on the region to be about $100 million each year. If the demonstration at the news conference is an indication, the games will be a thrill for even Gen Xers and baby boomers. A $5 refillable Go-To card to cover the round-trip fare plus free food and Dilly Bars was a deal most employees could not pass up. But the hope is that many will become regular bus riders to ease a parking crunch at 10 River Park Plaza and at Gillette's main campus attached to Regions Hospital. A line of severe thunderstorms raced across northern Minnesota early Thursday, killing two people in the Boundary Waters Canoe Area. The early morning rain won't bring much relief from the heat, the National Weather Service said. A 30-year term is now the anticipated sentence. Emergency responders worked to evacuate several injured campers from the Superior National Forest in northeastern Minnesota where a strong storm knocked down trees and caused other damage. The officer's SUV hit a box truck. The other driver also was injured.